After fiddling a little last night trying different types of needles in different sizes I finally got gauge for S's heart sweater with #9 Bamboo. The fabric is good - I know it will "plump" a little with a wash and spin through the dryer as my Honeymoon Cami did. Gotta love Cotton Ease! I changed the hems - I made her a roll hem sweater last year, (picture below) and wanted different edge treatments this year, so I went with a seed stitch border. Just 4 rows, but enough to keep it from curling, and add a little texture. I'll do the same at the wrists and the neck. Now, onto miles of stockinette! Come to think of it, her sweater last year was all sorts of bright colors, and she loved it! She is still wearing it - I made sure it make it a few sizes too big so she could get a few seasons out of it! I think this is the most projects I've had going at once. 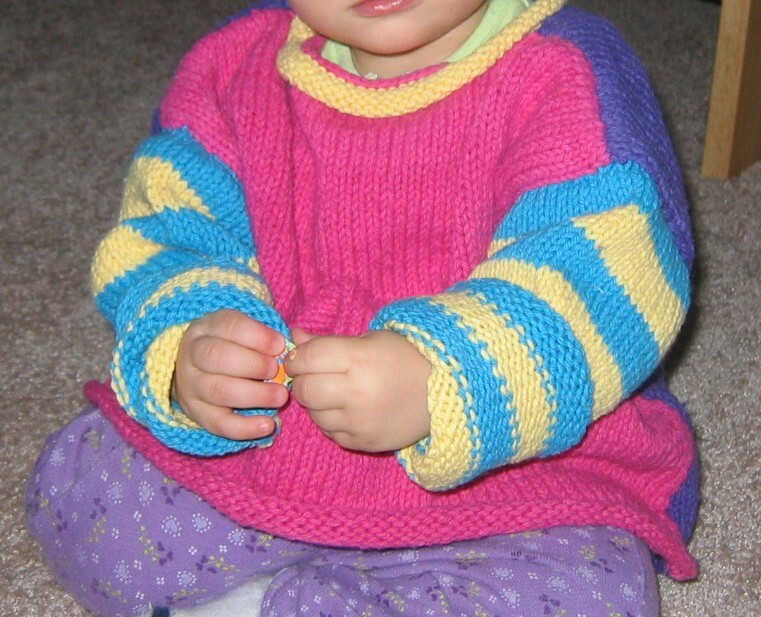 Granted, M's sweater isn't on the needles, but it is picked out and ready to start. I like having a main project, and a pair of socks going, but 2 sweaters and socks is a bit much for me to divide my limited knitting time. Hourglass only has a little to go, and I so just want to work on it to finish it, but S's sweater is for her birthday on the 26th, so I really have to make sure that is done in time. I'm hoping with football and the dog show on this weekend, I'll have time to work on both quite a bit. The dogs arrive tonight, so hopefully I can still get some knitting done. If, that is, there is any room on the couch!